Dimensional Engineering offers rentals of our high precision 3D metrology equipment. We have a multitude of different types of equipment and can help consult as to which is best suited for your occasion. We also provide training on how to properly use the equipment for those not familiar with how to operate it. Laser Trackers are a portable coordinate measuring machine (CMM) that are the optimal tool for the dimensional inspection of large equipment. Laser Trackers can quickly take precise large-volume measurements of assemblies, parts, and tooling in indoor or outdoor environments. They have a large working radial volume and accuracies up to 0.001 in. Laser Trackers are available to rent starting at $400/day. This versatile portable CMM allows you to inspect and measure complex parts and surfaces. It’s a tool for both contact and non-contact measurement. With the hard probe you can collect data on simple geometry on machined parts, while using the laser probe to measure more complex surfaces. The ScanArm’s volumetric accuracy is just over 0.001 in., making it perfect for part inspection and reverse engineering. 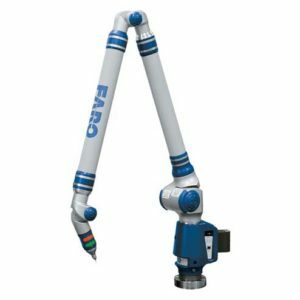 FARO Edge ScanArm is available to rent starting at $400/day. This versatile portable CMM allows you to inspect and measure complex parts and surfaces. With the hard probe you can collect data on simple geometry on machined parts. FARO Platinum 6 Axis Arm is available to rent starting at $300/day.